ACCRA, Ghana -- Yaa Kyerewaa cuts a lonely figure beside a pile of animal parts: the jaws of a giant rodent, the hooves of wild pigs, snails. 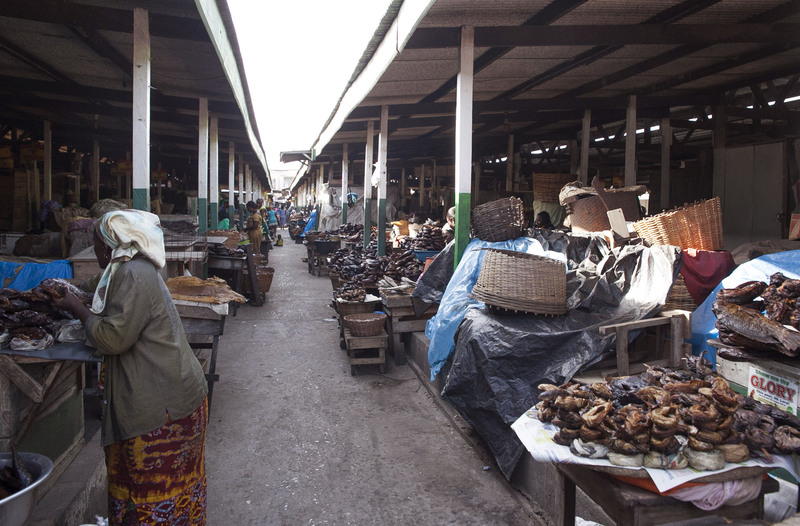 This bush meat was once considered a delicacy and fetched premium prices. But Ebola has frightened away customers and Kyerewaa hasn't sold anything in days. Accra's busy Agbogbloshie market used to have several bush meat vendors but now she is the only one. The 53-year-old says her earnings from bush meat keep her four children in school and she laments the sudden loss of business as public health officials warn that bush meat may be contaminated with the dreaded Ebola virus. "Bush meat is healthy. I usually eat it as a special food on Sundays," she said. "We have been consuming for years only for it to be made unpopular by these needless rumors flying around. No one wants to buy our products now. It is sad." Many restaurants in Ghana's capital no longer serve bush meat, of which a large rodent known as a "grasscutter" was the most popular offering. Hunters trap them in the wild or rear them at home for their meat, which is said to taste like chicken. Health experts believe the initial cases in many Ebola outbreaks start from people eating or handling Ebola-infected animals. Then they spread it to other people through contact with bodily fluids. Fruit bats, as well as primates such as chimpanzees, are frequently cited as potential reservoirs of the Ebola virus - animals many Africans hunt for their meat. Human infections in Africa have been linked to hunting, butchering and processing meat from infected animals, although none from eating cooked bush meat, according to the U.S. Centers for Disease Control and Prevention. Ebola first appeared in 1976 in Congo and has caused periodic outbreaks there and in other African countries. This is West Africa's first outbreak - and the most deadly ever - and the World Health Organization warns it could get worse before the situation improves. More than 4,500 people, mostly in Guinea, Sierra Leone and Liberia, have died. While stemming human-to-human transmission is the main focus for governments and international health agencies, African communities that hunt wild animals for their meat "risk future spill-over from species that can carry the virus," including fruit bats, some primates, and small antelopes called duikers, the Food and Agriculture Organization warns. Hunting animals that are sick or behaving strangely, or collecting dead animals for sale, is risky, the U.N. agency says. Despite the dangers, bush meat is a source of protein for many West Africans, and for some it is a special treat. The soup of a roasted fruit bat, for example, is highly sought after. Kyerewaa said she once had clients from all walks of life. That has changed with Ebola sweeping through West Africa and health officials stepping up campaigns to educate the public about how to avoid catching it. "I am the only surviving bush meat seller in this market," said Kyerewaa, who said she has been a bush meat trader for years. "I can't stop coming because I have to look for ways to support myself and my family." At her stall the parts of the great cane rat - smoked and salted for preservation - fetch as much as $30. That's out of reach for many in Ghana, where many live on less than $2 a day. Rebecca Ackwonu, a Ghana Health Service Commission official, said it's hard to enforce any kind of bush meat ban in a country where many people grew up on it. "We have advised our people to suspend eating bush meat in the meantime because of the risks," she said. Some have heeded the call. Theodor Semi, who operates a popular downtown restaurant called Semi's Place, said he won't serve bush meat until all of West Africa is declared free of Ebola. "It has affected business, of course," he said. "It has become slow because most Ghanaians like bush meat, especially grasscutter."